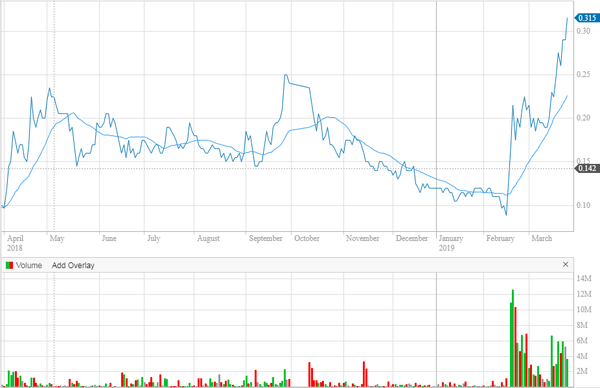 Leigh Creek Energy Ltd (ASX:LCK) has received a PRMS (Petroleum Resource Management System) of 1,153 petajoules 2P certification at the Leigh Creek Energy Project (LCEP) from MHA Petroleum Consultants, based in Denver, USA. This classification is a direct result of the success of the Pre-Commercial Demonstration Plant (PCD) at the LCEP, where the PCD produced all targeted commercial gases with commercial flow rates from a single gasifier. This 2P reserve certification confirms that the gas at the LCEP is of considerable value and has been independently certified as suitable for a commercial project, and now based on the Australian Energy Regulator report (2018) unequivocally represents one of eastern Australia’s largest undeveloped and uncontracted gas reserves. A recent commercial transaction between Origin Energy and Australia Pacific LNG (APLNG) implied a purchase price of $1.79 per gigajoule, setting a benchmark price for gas transactions that are currently uncontracted and still in development. 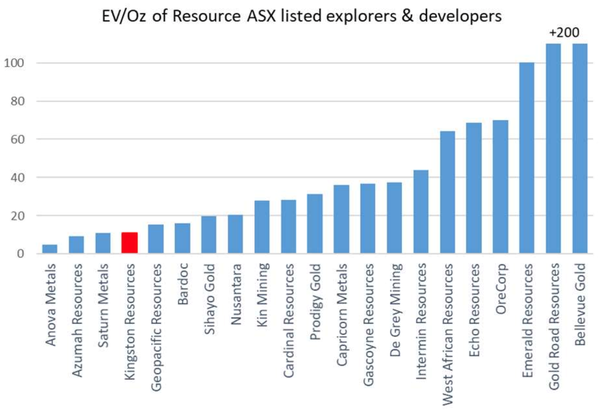 Interestingly, this suggests Leigh Creek could be sitting on a resource valued in excess of $2 billion - not bad for a company with a market capitalisation of sub $200 million, suggesting there is significant scope for a rerating based on the value of the company’s assets. Since February the company’s shares have increased more than threefold, but there could be more upside to come, particularly based on today’s news. As Finfeed flagged in February, the upgrade of a portion of the extremely large 2C resource to 2P status was likely to be a share price catalyst as it marked the transition of the resource from a ‘best estimate of sub-commercial contingent resources’ to an estimate of probable reserves, allowing Leigh Creek to attribute the term ‘commercial’ to the resource. 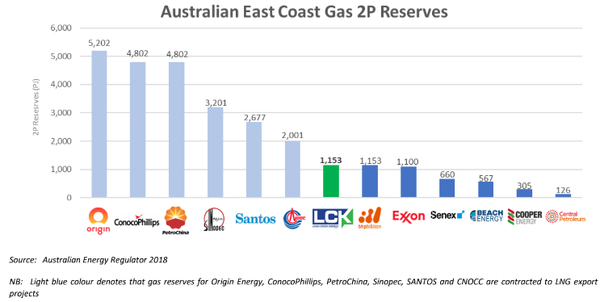 As indicated below, this places Leigh Creek in the top echelon of major energy companies with 2P gas reserves on the supply constrained, high demand east coast of Australia. 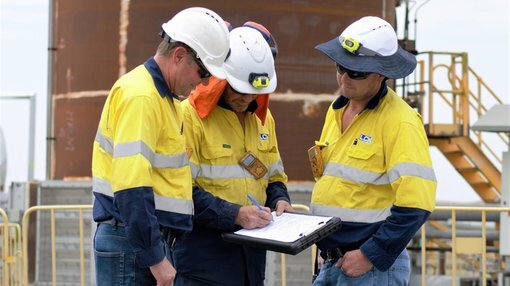 Eastern Australian gas consumers are currently facing an energy crisis, with a recent report released by the Australian Financial Review highlighting that east coast gas reserves would not be able to satisfy demand as early as 2022. Underlining the strategic benefits that these recent developments could have in terms of progressing the Leigh Creek project, executive chairman Justyn Peters said, “This independent confirmation and certification of such a large 2P energy reserve means that LCK can further advance with its negotiations with potential joint-venture partners on investment structures and the full-funding solutions for a commercial facility at the Leigh Creek Energy Project. Management will be updating the market on its progress in terms of reaching collaborative arrangements and/or other investment structures which would tick another important box on the way to development, as well as representing a likely share price catalyst. The PCD has demonstrated commercial gas production from 1 of 3 coal seams located within the Telford basin and there is additional opportunity for resource upgrades in the future. The company expects to realise a significant reserve large enough to support a commercial project of over 20 years. Thereafter, LCK expects that additional resources will be upgraded as the project progresses. LCK’s 2P resource of 1,153 PJ (1.1 Tcf) gas reserves are located entirely in the Telford Basin near the town of Leigh Creek, South Australia. 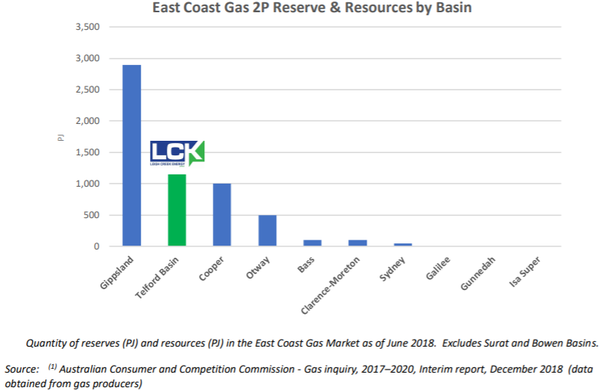 According to the Australian Competition and Consumer Commission (ACCC) analysis of Australian gas reserves and resources (1 - see reference below table), LCK’s reserves within the LCEP (Leigh Creek Exploration Permit) are approximately the same size, on a 2P reserve basis, as the entire Cooper Basin. Furthermore, the company holds a larger 2P reserve than the Otway, Bass, Gunnedah, Clarence-Moreton, Sydney and Galilee Basins combined. Leigh Creek’s PRMS assessment (reserve certification) is expected to increase over time as more information about the project and the petroleum accumulation are established. This additional information will be derived from a variety of sources such as further drilling, seismic work and production testing. Consequently, there are additional opportunities for future reserve upgrades of the 2C contingent resource figures to capture the resources contained in the upper series and lower series coal seams. As we briefly mentioned earlier, on February 20, 2019 Origin Energy announced the sale of the Ironbark Gas Project in Queensland to Australia Pacific LNG (AP LNG) for A$231 million (US$164.43 million) or A$1.79 per gigajoule. Fleshing out the numbers, the Ironbark Project contains 129 petajoules (proven and probable) of coal seam gas resources. (Source: Australian Financial Review 20 February 2019). This transaction sets a new benchmark price for gas transactions that are currently uncontracted and still in development. LCK has nearly 10 times the amount of 2P gas reserves as Ironbark. While there are multiple financial data points to consider in any transaction, based on the transaction metric of acquisition price to 2P reserves alone this would potentially provide LCK with an implied valuation that exceeds $2 billion. Leigh Creek has a number of options open to it in terms of commercially benefiting from its outstanding resource. Management pointed to a few of the strategic initiatives it could take in saying, “LCK has multiple commercialization paths for an asset of this size and quality, mainly the sale of synthetic natural gas into the Australian east coast market and/or using the gas to manufacture urea-based fertiliser products, both of which have significantly positive economic returns. “The company has capacity to enter both markets simultaneously, therefore, a third option exists in which a combination of the two previously-mentioned options are utilized. On this note Phil Staveley, managing director of Leigh Creek Energy, said, “This certification cements LCK’s project status firmly in the gas market in Australia.